"DIATULIP1"DIAMOND TULIP STAINED AND LEADED GLASS WINDOW CREATED BY JACK McCOY© IN ASSOCIATION WITH GLASS BY DESIGN. 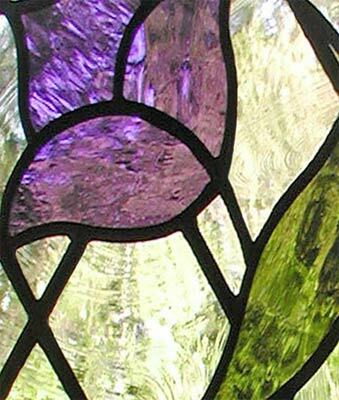 Stained and leaded glass tulip window 12" x 24" was commissioned for a home in Washington state. The background was clear Baroque glass. There was no color in the background glass. The camera sees everything through the clear textured glass.